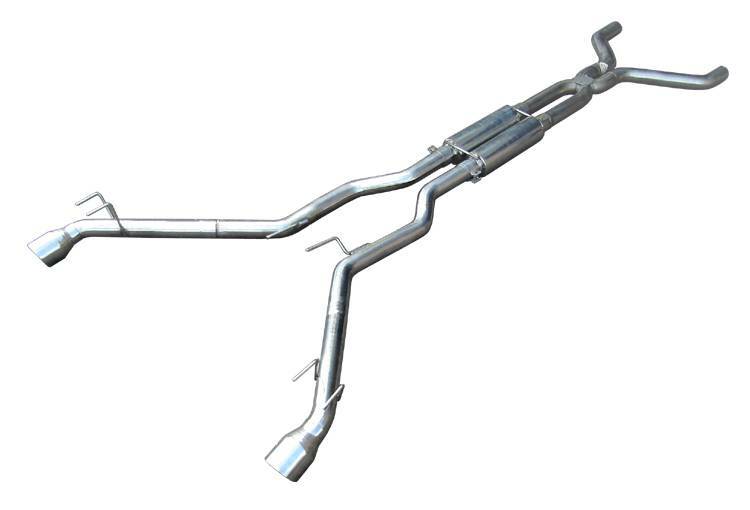 System INCLUDES M-80 Race Pro mufflers and tips. Coupe only! Does not fit convertibles. The 2010 Camaro was one of the most anticipated redesigns in the past couple of years. Once these modern musclecars started to hit the streets, we jumped at the chance to get our hands on them. After hearing the stock sound we decided to design our own system to improve performance and sound. We chose to add a Siamese x-pipe to our system to balance the two sides of the exhaust and increase flow. We replaced the stock resonators with a pair of our M-80 mufflers. 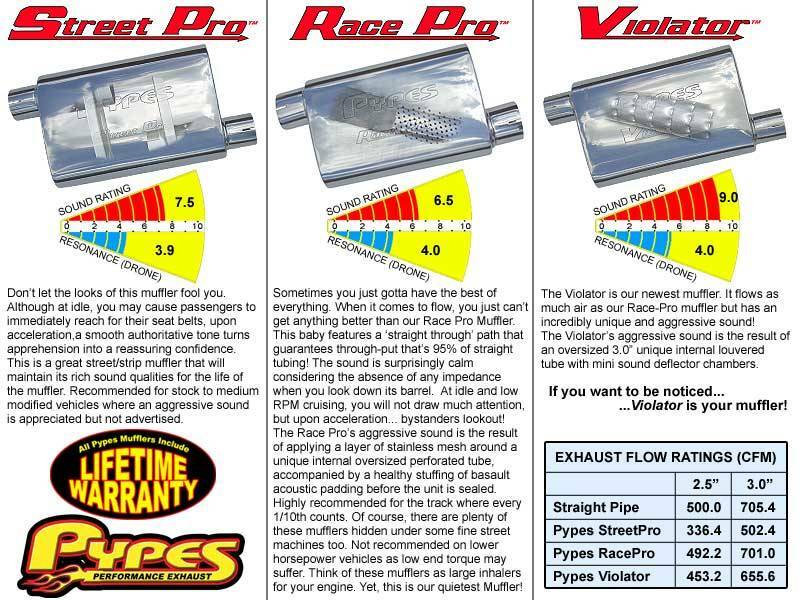 That allowed us to delete the massive stock mufflers all together and add a better quality tip. I bought this system at a car show from the Pypes vendor. Friendly group of guys that price matched the exhaust. Bought a shirt as well and they were excited to hear it on social media as well as my other Pypes products. As for the actual product, my initial thoughts upon opening the package were "WOW!" My '10 Camaro SS had a Borla S-Type catback which was nearly double the cost of a Pypes. Both are stainless, but the Pypes system is polished stainless and the tips are much nicer looking. Don't believe me? Google! The system was easy to install. I borrowed a lift and went to town. The car had a set of shorties and stock cats. I had to double check which direction some of the pipes went as the instructions were a bit vanilla. I don't like how the exhaust was in so many pieces. Also, the supplied band clamps are nice but overtighening led to breakage. I also don't like that the tips aren't welded on, but that's not the end of the world. As for fitment, I give it a 7/10 and ultimately why this system got a 4/5 star rating as a whole. The old Borla was perfect. Not as many pieces, welded tips, no rubbing anywhere. The Pypes, I wish I could say the same. For those interested in why catbacks cost over $1k, this is why. There is a thin, metal cross-brace under the car that the exhaust pipes go above. The Borla fit over this without issue, no rubbing/sagging. The Pypes pipes rests on this brace. Common issue with aftermarket exhaust on these cars. A lot of guys get an aftermarket brace to add clearance, add shims (tried, failed), or just remove it altogether. It's not a structural piece. I removed mine. My catback rubbed a bit on the exhaust shield under the driver/pass floor pans and I had to take an angle grinder to a stud under the car. The rubbing was due to the exhaust moving and needing a tweak after some miles on it. I had almost a year on the exhaust now and maybe 8k miles or so. The Borla had a nice tone at idle, but lacked volume and had drone on the highway. The Pypes has a better tone at idle, a tad more volume, and zero drone. Sounds stock while cruising until you hit the skinny pedal which I like. About to install some long tubes and catless extension pipes. I crave more power and noise and I think the dual M-80s will make me smile even more. One other thing to mention - the cat doesn't have any exhaust leaks and I have re-tweaked/tightened the exhaust a couple times since the initial install. One thing I do notice is that one tip will get darker than the other. I'm used to this on my Fbody due to the muffler and it's do to the exhaust gas flowing in the path of least resistance. This leads me to believe the X pipe is either not completely symmetrical or I'm just going crazy and there's a lead before the tip on one side I haven't identified. Regardless, every time I start the car, drive it, and go full or even part throttle, this system makes me smile every time. I should also mention that I'm not a mechanic, just a hobbyist that prefers to do as much DIY as I can. Bought the whole system for my SS camaro. Best they are. Wouldn't have anything else. I liked the design. Didn't want mufflers in OEM position. Fit could be better. Wrong clamps were in the kit, but Mike took care of that.